I’d been meaning to look into Docker for a while but never really seemed to find the time. After dithering about for a bit I decided to find a course, something short and to the point. A bit of googling later and I found a couple of one day courses run by Skippbox, the first course/day was all about Docker and the second was all Kubernetes. The courses were presented by Sebastian Goasguen, who wrote The Docker Cookbook. Very approachable and knowledgeable. Before the course Sebastian e-mailed me to ask that I install the Docker Toolbox. As I run a Linux desktop with VMware workstation, it didn’t really apply but did send me off looking into the toolbox and what it was all about. It’s basically an installer that aims to get you going with Docker on Windows or a Mac as quickly and as easily as possible by installing Docker Machine, Engine, Compose and as well as Oracle Virtualbox. No support for VMware workstation I see. Day one (course one): Hello Docker. The docker course was really interesting, and quite fast. At the beginning of the day Sebastian gave us an introduction the the history of Docker, where it came from, and what problems it could potentially solve in the enterprise. Then on to the basics of downloading our first containers, running, stopping, starting, gearing up to modifying and editing our own docker files, showing us how to setup our own repo’s,working with networking and security, and then flat out into continuous integration and more. All in I would say it was a very productive day. Day two(course two): Kubernetes, or as I like to put it, “ Lets dial this up to 11”. Since we’d all been on the course the day before, we hit the ground running, with a brief overview of the history of Kubernetes. Sebastian provided us with a couple of VM’s running in Digital Ocean and AWS, which we used for remote deployments and orchestration. The course went fast but at no time did I feel like I couldn’t stop and ask for clarification and more detail. Orchestration, clustering, proxying, static routes, resilience, to name a few. It went fast. Toward the end of the day we were working on our own examples that we felt were relevant with Sebastian helping and guiding. He also went on to show us kmachine, which is one of Skippbox’s main focuses. The two courses were a great introduction into containerisation and what it could do and gives you enough that you can go off and get setup yourself. I really liked Sebastian’s enthusiasm, which pushed me to look more into containers. You can tell he lives and breathes this stuff which made two days much more insightful. Looking to get into docker? These two courses might be just what you are looking for. So the last couple of months I have been fairly quiet on the blogging front, needing to spend much of my time upgrading my skill set. As we go forward in the infrastructure the hypervisor, and its core development is becoming less of a factor in deciding what to run. With the rise of cloud and containerisation, we have seen a huge shift in focus over to the infrastructure supporting these technologies. Management, automation, and software defined are seeing their importance rise, and rise fast. Where does this leave the likes of VMware? They are a hypervisor company after all. Well not anymore. Some bright sparks at VMware saw this coming and started to focus on cloud. Unfortunately, while VMware were very well placed to push their cloud offering, for various reasons it hasn’t done too well when compared to Azure and AWS. Fortunately, somebody at VMware decided that, to succeed, they needed to play nicely with all the other kids in the playground and with that came the rise of their updated software defined strategy and the vRealize suite; an encompassing suite of products purchased and developed by VMware to monitor, automate, manage, and secure your infrastructure. I am pushing hard to teach myself the vRealize product suite and I’m really enjoying it. Above all what I really appreciate is the agnostic nature of these products. Yes, they are owned and developed by VMware but they are designed to work with all hypervisors and most infrastructure. The book doesn’t pretend to be the definitive guide to Orchestrator, its purpose is to get you using it with confidence and give you a good grounding to find out more, if you want to. The author has also gone as far as to release an update in PDF to reflect the differences between the older version (which the book is written for) and the newer version. Truth be told not too much has changed. 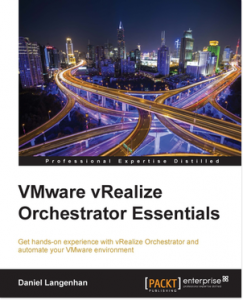 I would strongly recommend this book if you are interested in getting into Orchestrator. You don’t know JS – Up and Going by Kyle Simpson. 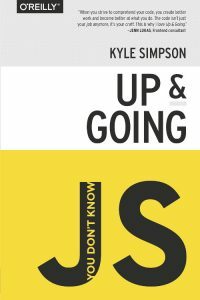 Kyle Simpson has many years of experience with JS and manages to explain the concepts in an easy to digest manner. He starts by using a very simple statement “a = b * 2;” and breaks it down. This was a great approach as he managed to impart a lot of knowledge right from the get go. The book continues to build on those basic building blocks and take you up to writing your own code. I have almost finished the book and I am going to buy the rest of the series once I do. As an IT professional you are constantly in a cycle of learning and investigating new technologies and emerging trends. Self study can be a bit tricky especially when you are time poor. Picking the right books can make all the difference and the two above will do just that.